Workers installed a Ten Commandments monument outside Arkansas' Capitol on Tuesday, two years after lawmakers approved a measure permitting the privately funded statue on state grounds. LITTLE ROCK, Ark. 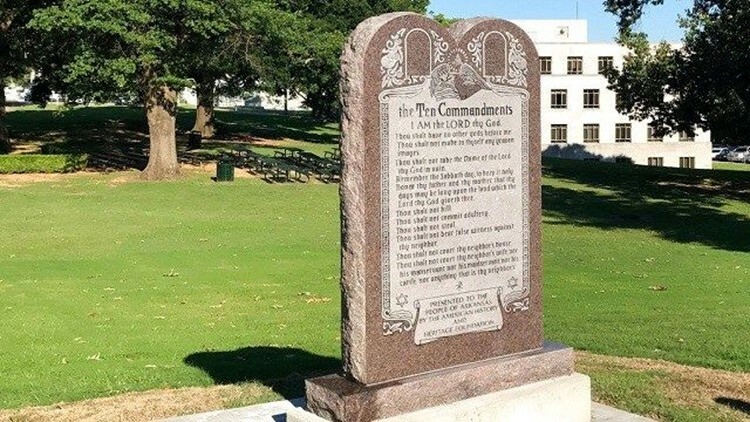 (AP) — Workers installed a Ten Commandments monument outside Arkansas' Capitol on Tuesday, two years after lawmakers approved a measure permitting the privately funded statue on state grounds. The 6-foot-tall (1.8-meter-tall), 6,000-pound (2,721-kilogram) monument was installed on the southwest lawn of the Capitol with little fanfare and no advance notice. A 2015 law required the state to allow the display near the Capitol, and a state panel last month gave final approval to its design and location. "We have a beautiful Capitol grounds but we did not have a monument that actually honored the historical, moral foundation of law," Republican Sen. Jason Rapert, who sponsored the measure requiring the monument's installation, said. The American Civil Liberties Union said it plans to file a lawsuit in federal court challenging the display, calling it an unconstitutional endorsement of religion by the state. The group said it did not have a timeline for filing the lawsuit. "Whatever they may say, the defenders of the Ten Commandments monument, the fact is the text of the Ten Commandments cannot be separated from its religious significance as the text calls individuals to adhere to moral precepts and uniquely religious obligations," Rita Sklar, executive director of the ACLU of Arkansas, said. Plans for Arkansas' monument sparked a push by the Satanic Temple for a competing statue of Baphomet, a goat-headed, angel-winged creature accompanied by two children smiling at it. Efforts to install that display, however, were blocked by a law enacted this year requiring legislative approval before the commission could consider a monument proposal. The Satanic Temple has vowed a lawsuit over the measure, and said it didn't believe the law should be applied retroactively to its proposal. Arkansas' monument is a replica of a display at the Texas Capitol that was upheld by the U.S. Supreme Court in 2005. The court that year struck down Ten Commandments displays in two Kentucky courthouses. The Oklahoma Supreme Court ordered the removal of a Ten Commandments display from that state's Capitol in 2015, and the state's voters last year rejected an initiative aimed at allowing the monument to return.